Casting of a gas turbine blade from MAR-M247 nickel-base superalloy is followed by multiple carbide precipitates as a result of solidification. The microstructure of carbide was established with scanning electron microscopy and energy spectrum analysis. A finite element model simulating the blade with a random carbide precipitate is constructed using ANSYS software, and stress-strain evaluation is performed. The blade operation conditions are realized in a vibratory-tensile combined test setup with stress measurements using strain gauges arranged on different parts of the blade. The respective von Mises equivalent stresses obtained in simulation and test measurements are found to be comparable and can be used to assess the blade fatigue life based on the available fatigue curves and Palmgren–Miner rule of damage accumulation. Simulation and experimental results are the basis for plotting the relationship between the volumetric ratio of precipitates in the blade and its fatigue life. The results obtained at room temperature can; be extrapolated to the elevated ones to provide more reliable prediction of the superalloy blade fatigue and creep-fatigue life values. 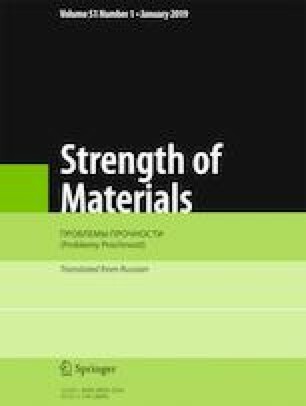 fatigue strength MAR-M247 nickel-base superalloy gas turbine blade carbide precipitates fatigue life prediction Translated from Problemy Prochnosti, No. 1, pp. 115 – 126, January – February, 2019. This work was supported by National Program on Key Basic Research Projects of China (No. 2013CB03570401), High-Tech Ship Research Project of Ministry of Industry and Information Technology (No. MIIT614) and Key Research and Development Project in Shaanxi Province of China (Grant No. 2017ZDXM-GY-054). X. Yan, X. Chen, R. Sun, et al., “Investigation on material’s fatigue property variation among different regions of directional solidification turbine blades – Part I: Fatigue tests on full-scale blades,” J. Eng. Gas Turbines Power, 136, No. 10, 102502 (2014), doi: https://doi.org/10.1115/1.4027928. H. Lin, H. Geng, X. Zhou, et al., “High cycle fatigue analysis of third stage blade based on shroud gap effect,” in: Proc. of the IEEE Int. Conf. on Mechatronics and Automation (August 7–10, 2016, Harbin, China), IEEE (2016), doi: https://doi.org/10.1109/ICMA.2016.7558834.